More than 1,000 UK troops have stormed the headquarters of an Iraqi police unit to rescue 127 prisoners, dozens of whom they had feared would be killed. 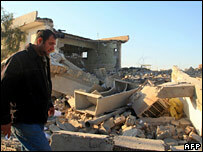 The forces demolished the Jamiat police station, which was the Serious Crimes Unit's base in Basra. The British said the unit was suspected of murder and the rescued prisoners appeared to have been tortured. However, Basra council described the raid as illegal and has suspended co-operation with the military. Mohammed al Abadi, head of the city's council, also said the move was provocative. He said the council had withdrawn co-operation with the military, saying they had not been informed of the operation and that it violated earlier agreements. Major Charlie Burbridge, speaking on behalf of the British Army in Basra, insisted that the troops had prior political support from Iraq's prime minister, Nuri al-Malaki. 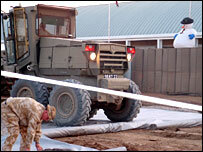 Soldiers from 19 Light Brigade supported by Iraqi forces surrounded the police station before the Royal Engineers used a combat tractor to breach the walls. Then, warrior vehicles from Staffordshire Regiments entered the compound and troops stormed the buildings. A Ministry of Defence spokesman said 1,000 troops were involved and hundreds of seized files and computers have been taken as evidence. An Iraqi security official said: "The interior minister decided to cancel the serious crimes unit in Basra city and replace it with a new one based inside the headquarters of Basra police. "The decision was made two days ago on the grounds of security violations by the serious crimes unit." The Christmas Day raid on the police station took place at about 0200 local time (2300 GMT) and was a "very significant move" according to Maj Burbridge. It came after seven Iraqi officers were arrested on Friday suspected of corruption and leading a death squad at the unit. "For some time we've been talking about culling the police force, well this is exactly what we've done," he said. "We've removed a very significant and nasty part of the police force which has been scaring people in Basra, and ultimately it's going to make Basra a better place." Maj Burbridge said the Jamiat building was "very significant" and claimed that the unit had been involved in the murders of both locals and international troops. "Whilst that building remained on the skyline, it was always a reminder of the Serious Crimes Unit and the crimes they commit and also the former regime. "Now that has gone, it removes that reminder and we can continue to rehabilitate the remainder of the police force." The operation was planned since July but intelligence led them to act fast to prevent the alleged killing of prisoners. Forces came under initial small arms fire and rocket-propelled grenade attack before moving in to set up explosives to destroy the building, he added. The troops carried out medical assessments of detainees before transferring them to another police station, and said there was evidence of torture. Some had crushed hands and feet, and electricity burns and gun shot wounds to the legs, they said. The troops had full support from helicopters and heavy armour. A military operation at Jamiat in September last year rescued two British soldiers - arrested for allegedly shooting dead a policeman and wounding another - sparking unrest in which Army vehicles were attacked. There have been long-held fears that the Iraqi police was being infiltrated by corrupt officers. And British forces have said some Iraqi commanders were using the unit as a cover for death squads and criminal activities which they controlled. BBC News correspondent Huw Williams said the demolition of the building was a visible symbol of the hope that the serious crimes carried out by police officers based there should now come to an end. Basra, Iraq's second biggest city, remains dangerous, with Shia factions battling each other for control. The UK has 7,200 troops in the south of Iraq, mostly in the Basra area. British soldiers have been making the best of Christmas away from home, and have put up decorations at their bases. Officers will serve their men Christmas lunch, and midnight mass and carol services have been organised. However, Captain Tane Dunlop said: "There is no day off. We are still on patrol, supporting patrols, working on logistics and so on."